Lemon and garlic tend to be the easiest flavors to match with shrimp to end up with a delicious end product. This recipe can be prepared in about thirty minutes, but much of that time is preheat time. This recipe for a baked shrimp in a lemon and garlic sauce is essentially a slight modification of our pan-fried garlic butter shrimp recipe. Serve with rice. Or don’t. This recipe is based on two pounds of shrimp, which should be more than enough for a family or one or two very hungry people. Preheat your oven to 450 degrees Fahrenheit or 230 degrees Celsius. While your preheating your oven, place a cup of butter in a small saucepan over medium heat. Add your lemon juice, parsley and garlic to the butter and stir it around until the butter is completely melted. If you choose to use Dijon mustard, you would add it now as well. Arrange your shrimp in a baking dish. Any dish will do. Even a cookie sheet covered in foil if you’re really desperate. Pour your melted lemon garlic butter mixture overtop of the shrimp. Try to get it on every piece. Full coverage is kind of important. Bake the whole thing in the oven for about twelve to fifteen minutes. You can tell the shrimp is about done when it turns pink and opaque. Always buy shelled and deveined shrimp. It’s just terrible doing that part. Trust me. Substitute the lemon juice out in place of lime juice for a softer citrus flavor. You can follow our guide on how to get more juice from a lime and actually only use a lime or two for the whole recipe. 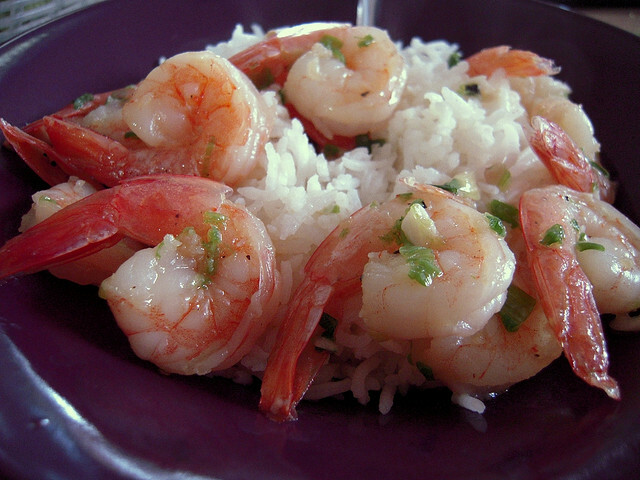 A good casserole dish would be the best thing to use for baking the shrimp in this recipe. Some places offer very specific and fancy deviled eggs recipes. This isn’t that. There’s a good chance that nobody in the whole world eats enough deviled eggs to need a variety of recipes for them. 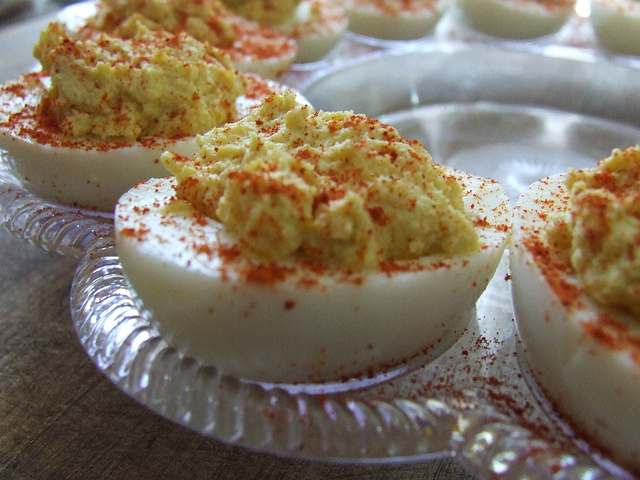 This is a classic deviled eggs recipe. This is what people think of when someone says deviled eggs. You don’t need one of those fancy deviled egg plates, but it would be nice. This recipe makes twelve deviled eggs out of six eggs. If you need more, double it up and make it a whole dozen. Deviled eggs are actually extremely easy to prepare. 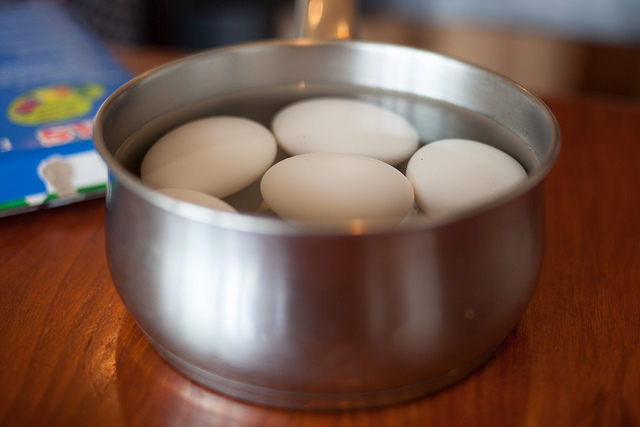 Once you have hard boiled your eggs (check out this guide on hardboiling eggs perfectly if you’re not completely confident) there is only a few steps to make your deviled eggs. 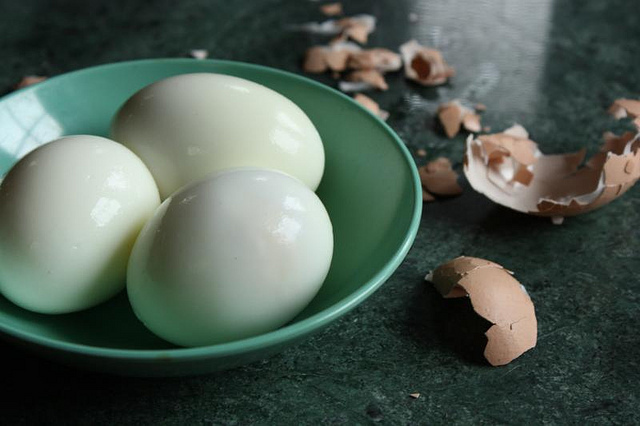 Cut your hard boiled eggs lengthwise and remove the cooked egg yolks. They should pop out very easily, if you did a good job hard-boiling the eggs. Throw the egg yolks in a bowl and add your dry mustard, white vinegar, and your salt and pepper. Start mixing in your mayonnaise – you should start with a quarter of a cup. A quarter of a cup of mayonnaise will give you a fairly firm consistency, so feel free to gently add more to the mixture to get a consistency you are happy with. There is no hard rule, but if you go over half a cup, you have more than likely gone too far. Once you’ve mixed everything together you can re-add it to the egg white shells. Put it where you removed the yolks from. Place your almost-finished deviled eggs onto a plate, sprinkle them with paprika, cover them up, and put them in the fridge. Let them cool for a few hours and you’re done. You can add horseradish or some chopped green onion or basically anything you want. But then that wouldn’t be classic, would it? Deviled eggs get a bit better when they’ve been given a good amount of time to cool. It’s best practice to make them the night before you plan on eating them. Hard boiling an egg is a very simple process, but perfectly hard boiling an egg every single time is a little bit less simple. This guide will help you make perfect hard boiled eggs every time. Bring your eggs out of the fridge before you get started. You will want them as close to room temperature as possible. While this isn’t terribly important, it does help ensure the eggs don’t crack when you boil them. A cracked shell during cooking will result in a rubbery egg. Too much room is almost as bad, as it causes the boiling process to take too long and overcooks your eggs. Start out with a large pot filled with water. You will need a large enough pot that your eggs can be rested at the surface of the water without being stacked one upon another. See the picture to the right for an example. With your eggs already placed in the water, bring your pot to a boil. As soon as the water reaches a proper rapid boil, remove the pot from the heat source and cover it with a lid. How Long to Cook Hard Boiled Eggs? Once you have removed your eggs from the heat source you will leave them covered for between fifteen and twenty minutes, depending on the size of the egg. Longer for larger. You should set a timer, because as soon as it hits the mark you choose based on the size of your egg, you must drain the hot water and cover the eggs in cool water. Leave the eggs sitting in cool water for a few more minutes. The cool water serves two purposes: it prevents your eggs from overcooking, and it helps build up steam between the egg-white and the shell, which will make peeling the eggs easier. Be careful about overcooking the eggs or leaving them unattended for too long. You can end up with a less than palatable film around the yolk. When peeling the shells from your hard boiled eggs you should always start from the larger end. Because of the way the eggs would have cooked, there will be a small air bubble to assist with de-shelling your eggs. Also consider de-shelling the eggs under cool running water. It helps get rid of any little excess pieces. 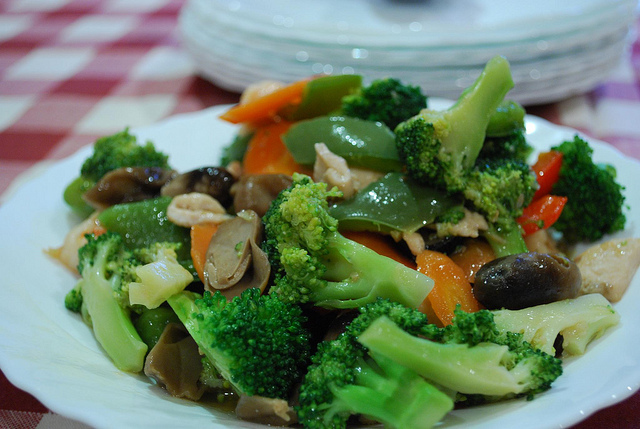 There is a very simple “trick” to ensure that your pan-fried vegetables don’t end up all soggy. You can keep them crisp and delicious by following a few simple tips. When frying your vegetables in a pan the most important thing to do is make sure you give your oil enough time to pre-heat. Regardless of what kind of oil you are using, if you add the vegetables before it is hot enough to “spit,” then you’re going to end up with soggy vegetables. If you’re not sure if you’ve given your oil long enough to preheat, give it longer. You’ll get a sense for how hot is hot enough over time. This is the most important thing you can do to end up with properly fried vegetables. Another thing you can do to ensure your fried vegetables come out perfect every time is to cut them at reasonably even sizes. Even if you’re frying multiple types of vegetables, if you keep them at fairly uniform sizes, you won’t end up with randomly under-cooked or over-cooked pieces. Onions and mushrooms take less time to fry than most other vegetables. Carrots or large pieces of broccoli or cauliflower take longer. If you’re going to be frying multiple types of vegetables in one pan, add carrots or broccoli first, and add onions last. Almost always. Specific recipes may have reasons for exceptions to this specific rule, but the first two tips will always apply. This simple recipe for sweet and sour chicken doesn’t use any crazy Chinese ingredients. It’s basically the american-ized version of the dish. It’s also very delicious. This recipe is intended to be served with rice, but there is no rice in the recipe. Serve it with rice anyways. This sweet and sour chicken recipe uses this simple sweet and sour sauce recipe. An abridged version will be included below to keep everything on one page, but the sauce can be used for many other dishes as well. Bring a frying pan to medium heat and start cooking your chicken. While your chicken is cooking, chop your red peppers, green peppers and onions into fairly large pieces. 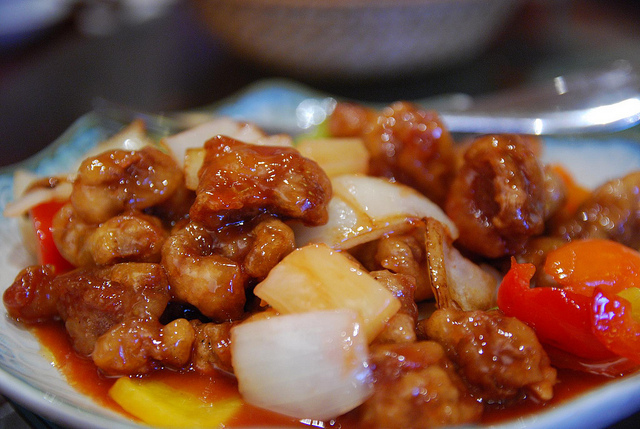 Big chunks of each is the general standard for sweet and sour chicken. Finely chop your garlic cloves and your ginger. While your chicken is (probably) still cooking, start preparing the sweet and sour sauce. In a saucepan and bring to a boil. Cook for about 5-7 minutes or until the sauce thickens. With your chicken (probably) about cooked, add a few tablespoons of vegetable oil to a frying pan and begin cooking your peppers, your garlic, and your ginger. Once the peppers have started to soften, add your onions. Cube up your chicken breasts and add those as well. Pour your sweet and sour sauce overtop and allow to simmer for a few more minutes, and you’re done. This recipe is written in an order that allows for the cooking times to align with your prep time. You can pre-make the sweet and sour sauce if you consider it simpler. If you choose to use the pineapple, add it at the same time you re-add the chicken. Some recipes suggest you cook the chicken along with the peppers. This one doesn’t. It’s for health reasons and for simplicity’s sake. Do what you will. This is a simple homemade recipe for sweet and sour sauce. 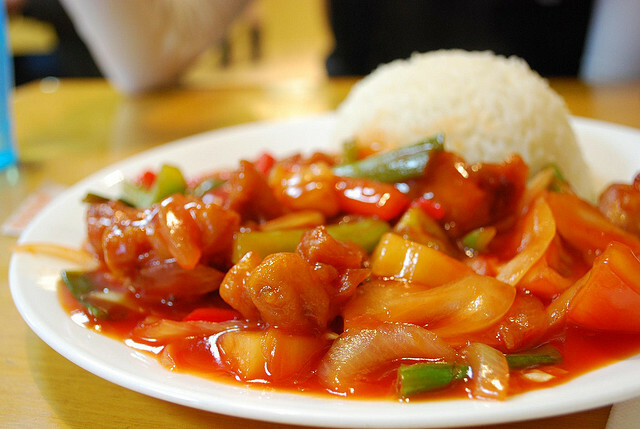 Sweet and sour sauce is used primarily for chicken or pork dishes, but can also be used for fish as well. This recipe seems a little bit simple, and isn’t 100% authentic, but it is a delicious sweet and sour sauce you can make in about ten minutes. To make more sauce, just multiply the ingredients. Don’t worry too much about being exact with your math. Minor variations taste pretty much the same, anyways. Bring a saucepan to medium-high heat and start combining ingredients. It’s usually easiest to combine the water, vinegar, soy sauce, ketchup and corn starch first, and slowly stir in the sugar. It’s quite a bit of sugar and you want to make sure it fully dissolves to ensure your sauce ends up delicious. While you’re stirring, your mixture should gradually come to a boil. Once it reaches a boil, slightly reduce the heat. Continue simmering until it starts to thicken. The cooking time should only be about five to seven minutes, but going a bit longer is okay to get a thicker sauce. You can substitute out the white vinegar for rice vinegar if you want to get all fancy and authenticy, but most people prefer the familiar taste of white vinegar. Don’t worry if the sauce continues at a rolling boil when you reduce the heat during the cooking time. It doesn’t end up “burnt” unless you really, really overdo it. The higher the temperature while you simmer it, the quicker it cooks. Bringing it down a bit further is probably the best plan, though. 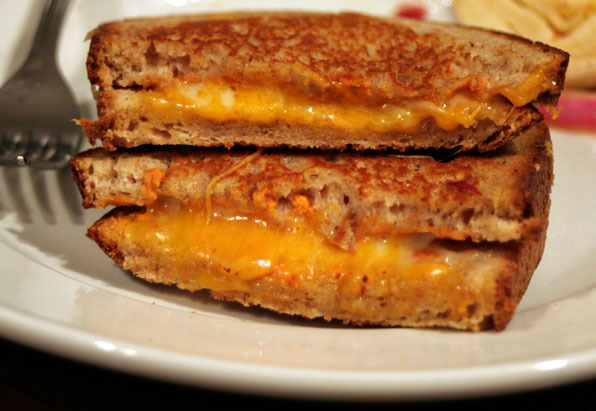 The grilled cheese is incredibly easy to make – it’s essentially just melted cheese on bread. The perfect grilled cheese sandwich is a little bit more elusive. Everyone has whipped together a grilled cheese sandwich and ended up with one slightly burnt side. If you follow this recipe you can avoid burnt grilled cheese mishaps from here on out. Probably. And butter. Lots and lots of butter. Or margarine. You can optionally include all kinds of other crazy things. Such as onions or a fancy weaved up slab of bacon or whatever. But if you’re going to go through that kind of effort you should probably eat something fancier than a grilled cheese sandwich in the first place. Bring your frying pan to medium-low heat. Start this before you really do anything else. It’s very important that the pan has time to come to an even (medium-low) heat. Throw in a glob of butter while you’re waiting. Swirl it around as it melts to give yourself an extra buffer between pan and burnt grilled cheese. While you’re waiting for the frying pan to heat, start applying copious amounts of butter or margarine to one side of each slice of bread. The important thing to remember when applying butter for a grilled cheese sandwich is that one side should be entirely coated from crust to crust. Any un-buttered space left at the edges will burn instead of becoming goldeny brown goodness. Place the two pieces of bread against each other, with each buttered side against the other slice’s. This allows you to place the sandwich on the counter-top to add cheese before actually cooking, and also helps ensure that each side of the sandwich will be evenly buttered. Add cheese. Sliced. Place it on the not buttered side. When putting your sandwich in the frying pan you can pick up the top slice of bread and the cheese, place it in the frying pan, and then pick up the bottom slide of bread and place it on top of the sandwich in the frying pan. Cook on one side for two or three minutes. Flip. Cook on the other side for two or three minutes. Play around with cooking times on your stove. Always use medium-low heat, but try to figure out the optimal cooking time for each side of your sandwich. It is important to minimize sandwich-flipping to prevent outer-layer sandwich toughness. If you opt to go with additional toppings, make it a bacon and grilled cheese sandwich. With the amount of butter this recipe recommends using it is one of the most delicious (and unhealthy) things in the world. Use real cheese sometime. It’s more expensive but it’s much, much better. Wait a second – why is a grilled cheese sandwich pan-fried?